Over the holidays, I made my first visit to Trader Joe's. I know, right? Small town living doesn't exactly afford such luxuries, so my friend and I decided to check one out while visiting another friend. It was a grand trip except that we chose to visit on a Sunday evening when everyone and their mother was trying to buy groceries. Even though I could barely move through the store, I hit the jackpot on all things salted caramel. Salted caramel chai. Salted caramel candies. Salted caramel cookies. So good and so bad. They all made it into my basket. It was quite the sugar high. Then the holidays were over, and I had to go back to eating vegetables. I knew my first cupcake should be of the salted caramel variety. Because of course I have to bake not so diet friendly cupcakes to continue my cupcake challenge. So what if I also get to partake of the the salty sweet goodness? It's for the greater good. Right? Right. This cupcake scared the bajeezus out of me. I'm not a candy maker. Yes, I've made marshmallows & buckeyes. Those are practically foolproof. But caramel? I made it anyway, and I can tell you with confidence that caramel isn't really that hard. It just requires a lot of attention. Lock the doors. Turn your phone off. Give the dog a bone. Because it needs your undivided attention for 20 minutes. You can totally make this. Set out the cream on the counter while preparing the other ingredients. In a sauce pan over medium heat, pour in the water and sugar. Stir only slightly to combine the sugar with the water. Let it boil and do not stir until the mixture turns a deep amber color. Remove pan from heat. Being careful to avoid splatter, slowly whisk in the heavy cream. If the mixture seizes, put it back on the stove top over low heat and whisk until the mixture becomes smooth. Remove from heat and stir in the sea salt. Pour into jar or other heatproof container. Allow to cool. Preheat oven to 350*F. Prepare muffin tin with cupcake liners. In a medium bowl, whisk together the flour, baking powder, baking soda, and salt. Set aside. In the bowl of a mixer, cream together the butter and sugars until light and fluffy. Mix in the eggs one at a time until combined. Alternate between stirring in the dry ingredients and milk, beginning and ending with the dry ingredients. Stir in the vanilla and caramel sauce until thoroughly combined. Fill cupcake liners 2/3 full with cupcake batter. Bake for 16-18 minutes or until a toothpick inserted into the middle comes out with a very light crumb. Allow to cool in the pan for a few minutes and then remove to cooling racks. 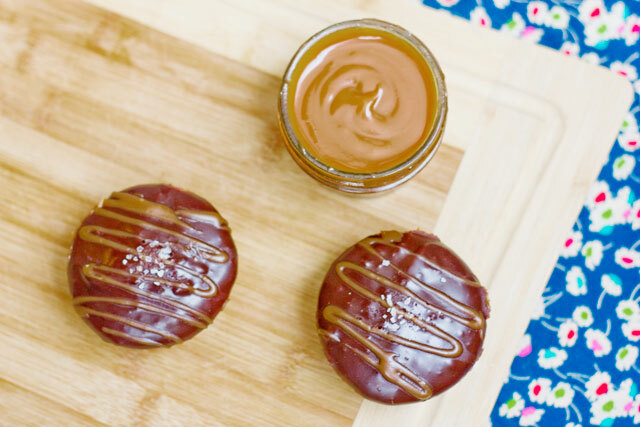 Dip each cupcake into the ganache and allow to set up. Drizzle with caramel sauce. Sprinkle with sea salt just before serving. Place a heatproof bowl over a pan of simmering water. Do not allow the water to touch the bowl. Pour the chocolate chips into the bowl and cover with cream. Slowly mix together until the chocolate is melted and smooth. Remove from pan and use immediately. I have never been to a Trader Joe's. Not so sure they have one around my area. 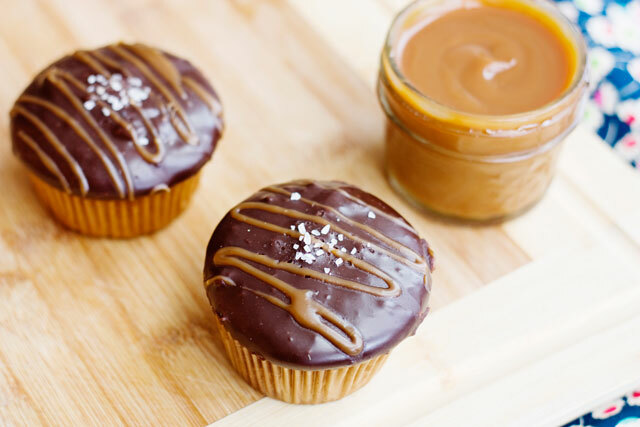 Salted Caramel Cupcakes are good! These look really yummy too!